Community engagement is an important aspect to any site specific artwork. Our public spaces are just that, they belong to the community and interventions which do not seek consent or understanding from the local community risk alienating those whom it is meant to benefit. In this article we look at how Gary Drostle delivers community arts projects and the various options available for successful community engaged projects. 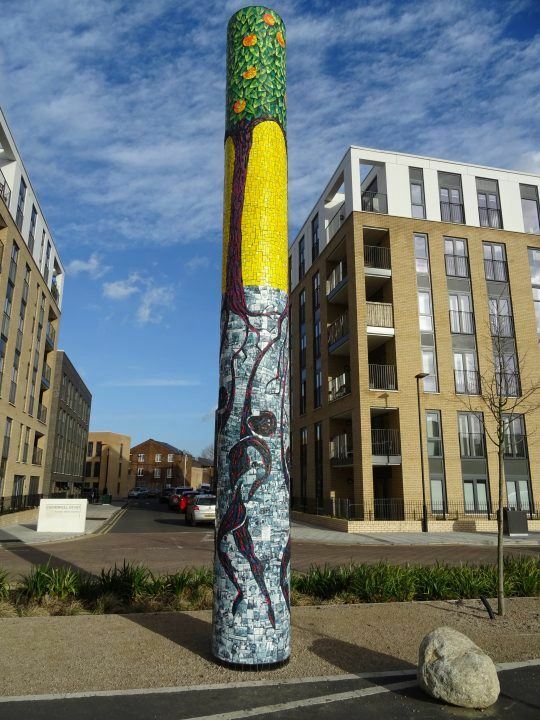 The article is specifically about creating site specific artworks and how the wider community can be involved in the process. The Enduring Tangerine Tree – The story of a community. The work features hundreds of photos given by residents along with archive images. There are a lot of words bandied about when talking about art in the community (community arts; public arts; site specific arts; arts in the community) but it’s all about listening and understanding the views of the community who are going to have to live with the final artwork and helping them to understand, appreciate and engage the final work. That engagement can take many forms from simple information exchange to full participation. 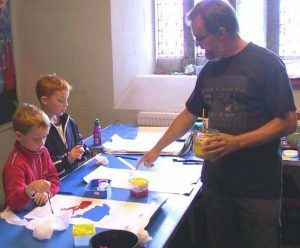 With over thirty years experience of delivering community engaged public arts projects to many different community groups and at a variety of differing levels Gary can offer a full spectrum of engagement methods. 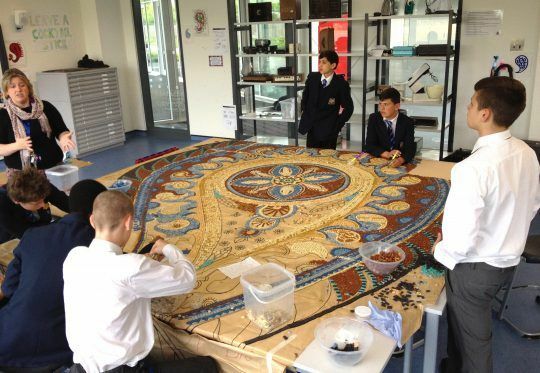 Haberdashers’ Aske Crayford Academy at work on their mosaic. Gary has worked with Primary Schools, Secondary Schools, Colleges and Universities. Whether the end result is for the educational establishment itself or a contribution to the wider community. 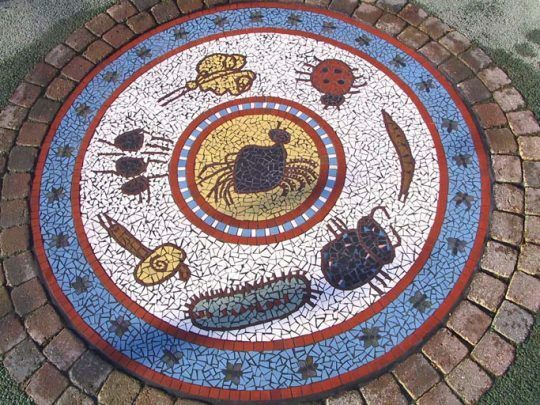 Carpenters Road Infant School – Mini Beasts Mosaic Pupils at the infant school helped design and make this playground mosaic. Professional artist in School: In these days when the arts seem to be being squeezed out of schools bringing an artist in can help to redress the imbalance. Bringing in an artist can help develop a project into something bigger that can benefit the whole school. The wider curriculum; Creating an artwork in your school can incorporate so much more than just the art and design curriculum itself. Skills and links to many other areas of the curriculum are involved including: mathematics; history; technology; social integration; ecology; school community outreach. Organised community groups offer a great way to engage with local residents. Mosaic is an amazing medium when it comes to community engagement. 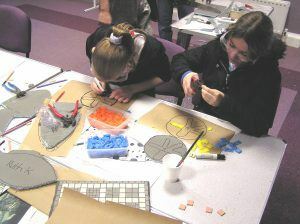 Unlike other art mediums mosaic is very inclusive. 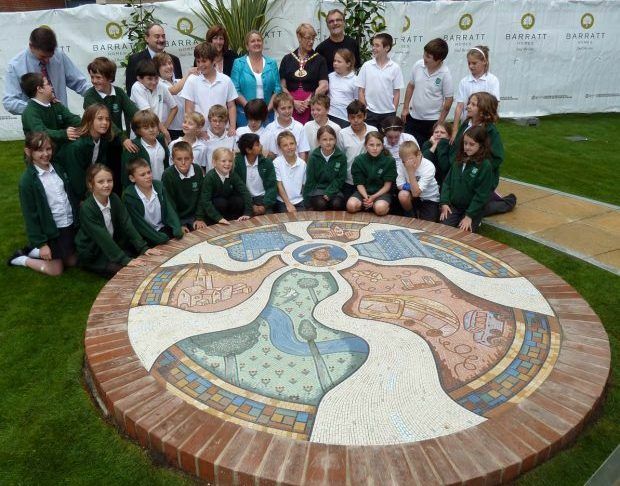 Many hands go to making a mosaic and the whole project becomes about a communal effort and people coming together to improve their environment. Gary has a wide range of experience working with a vast array of community groups. Here is a list of just some of the type of groups worked with to date: Unemployed Workers Group; Youth Clubs; Tenants Associations; After School Clubs; Care Homes; Lesbian and Gay Groups; Trade Unions; Schools and Colleges; Hospital Schools; Black and Asian Groups; Refugee Groups; Community Fair Drop-In; Pop-Up Shop events. The community aspect of the engagement can be just at the design stage.